It's been a good little while since we saw a major overhaul in the UI of the Android OS. I'm sure many of you remember back in the day when Android just looked plain ugly, and Manufacturer skins made it look nicer. In case you need a refresher, check out this image. Compared to Holo and even Material Design now, that's a huge change! Right? Android 5.0, which is named Lollipop, was first shown off at Google I/O earlier this year. It was named Android L at that time. Since then we have been drooling over the developer preview of Android L. This week Lollipop started rolling out to various Nexus devices. We've been using it on the Nexus 9 and Nexus 6 (and to an extent on the Nexus Player) for a little over a week now. So it's time to do a full review. Sit back and enjoy guys, this is going to be a long one. In 2010, Matias Duarte was hired as the Director, of Android User Experience. He brought us Ice Cream Sandwich in 2010 on the Galaxy Nexus. Which was a major departing from the Tron UI we had in Honeycomb and the Gingerbread UI. In the three iterations of Jelly Bean (4.1, 4.2, and 4.3) we saw very little subtle changes in the UI. But with KitKat we saw the Tron blue starting to go away. Then came Android 5.0, Lollipop. Where we saw a huge change. And to be honest, Matias and his crew have been working on this since he got to Google in 2010. So this has been nearly 4 years in the making and it definitely shows it. Let's start with the design here. The fanboys will probably hate me for doing this. But when Apple unveiled iOS 7 last year, their update was literally all the design. But that's not the case here with Lollipop. Sure a big chunk is the new design language introduced here. But there's way more beyond the surface. Material design, which is what we're calling this interface, is taken from cues of real-world materials. It's much more then just looking nice on the Nexus 6 or the Nexus 9. The interface on Lollipop is a bit complex, but at the same time easy to understand. That's something that only Matias Duarte could bring us. Lollipop is a breathe of fresh air and makes your Nexus very snappy. I've been using the Nexus 6 and DROID Turbo for the past week or so. They both have relatively the same specs. But one has a smaller display. Also one is running Lollipop while the DROID Turbo is running on KitKat. And you can definitely notice the difference between the two. The Nexus 6 is a whole lot smoother in comparison to the DROID Turbo which is no slouch either. Transitions and animations have become a pretty big deal on Lollipop. Simple things like swiping over to Google Now, or long pressing the home button to get to Google Now. To even open the Settings or selecting an option in Settings. They all have unique animations that look amazing. In fact, I've spent a ton of times just playing with the animations on the Nexus 9 and the Nexus 6. Overall, the update to Lollipop is a pretty big deal. Not only do we have a fresh new UI and experience here, but we also have about 5000 new APIs and countless other features here. It's literally the biggest update ever to Android. Gmail saw a pretty big update with Android 5.0. On the phone side of things, we now have a more modern looking app. For the most part, everything acts as it did before hand. When you swipe from the left to right you are greeted with a redesign menu. You'll see your Google+ profile picture and banner up there with your tabs as well. For Primary, Social, Promotions and Updates. As well as all your other labels beneath it. If you scroll all the way to the bottom you're greeted with the Settings as well as Help & Feedback. If you tap the down arrow on the right side of your email address, you have the account switcher there. Where you can either switch accounts or add a new one. You can also manage accounts from there. Under the "Add Account" option you can add a new Google account, a Personal IMAP/POP account (this includes Yahoo, Outlook, AOL Mail and others), as well as a Microsoft Exchange account. What this means is that you can use your regular email in your Gmail app. So now one app can handle it all. When you're inside an email in the Gmail app, you'll see that the action bar at the top is red, as expected. Also there's options for Archive, Delete, Mark as Unread and the action overflow for more options. The action overflow includes options like Move to, Change Labels, Mark as Important, Mute, Print, Report Spam and Report Phishing. At the bottom of the message you'll see options for Reply, Reply All, and Forward. They are also in the message across from the senders name and email address. When you're composing an email, you will see the ability to change which email you're sending this from, as well as all the usual spots for the Recipient, Subject and the email. There's a paperclip at the top for attaching items and then a paper plane like icon to send it. Google also has the status bar tinted red, and it looks really nice. Next up, we'll jump to the Calendar. The Calendar app has been neglected a lot lately, but it looks like the Calendar department at Google has been hard at work. The update to the Calendar is much more then just Material Design. From the slideout menu you will see all of your calendars and what color they are. You can also choose to have them appear on your calendar or not. Towards the bottom is your Settings. In the action bar you have just two options. One for jumping to today, and one for the action overflow. Inside the Action Overflow, you've got your different ways to view the calendar, as well as a search button and refresh. The calculator also got a redesign. There's not much new here in terms of functionality. But we do have two different tones of grey, plus the green strip on the right side, and the status bar is colored blue. Otherwise, nothing is new here. Also changed is the clock app. It will now change colors based on the time of day. But similar to the calculator app, the actual functionality has not changed at all. You can also add the Contacts to this list. It's changed it's name from People back to Contacts. And has mostly just changed colors to a more royal blue. We do have a floating button on the right side to add a new contact. The Dialer, which most of us probably don't use anymore, has also been updated. When you open it up, you'll see your speed dial numbers, and a tab for recents and contacts. There's also a search bar at the top. Now at the bottom you'll see the dialpad icon. Just hit that and you'll see the usual dialer. Which looks very minimal, yet beautiful all at the same time. Google has also included a messenger app this time around. This one is open source, and Hangouts can still handle all your SMS and MMS. It's gotten a much needed update and looks beautiful. It's in Blue and Yellow (or Maize and Blue, if you know what I mean). Let's start at the lock screen. In fact, let's start a bit further out with Ambient Mode. Now ambient mode is supposed to be similar to Motorola's Moto Display that they debuted last year. Basically when you pick up the device the screen will come on, but dimly, to show you your notifications. Unlike the Moto X, it will not turn on from you waving your hand over the screen - which is a pretty awesome feature by the way. It also won't come on if you don't have any notifications. This can be turned off in the settings if you don't want to use it. Now on the lock screen you'll see your notifications in the middle, with the phone dialer and the camera on the left and right side respectively. If you swipe from the left you'll open up to the dialer, and from right to left you'll jump into the camera. If you double tap on a notification you'll unlock straight to that app that the notification came from. Then there's home screen. To be honest, there's not a whole lot of functionality change here in Lollipop. The biggest changes you'll see is that the frosted app drawer and Google Search box are now white. You can still swipe over from the left to get to Google Now, which actually has a few changes, like the slideout drawer for settings, reminders and other things. There's also a bit more color now. The app drawer now opens up as almost like a window on top of your home screen. The background is also white now. We're looking at a 4x6 grid here on the Nexus 6. 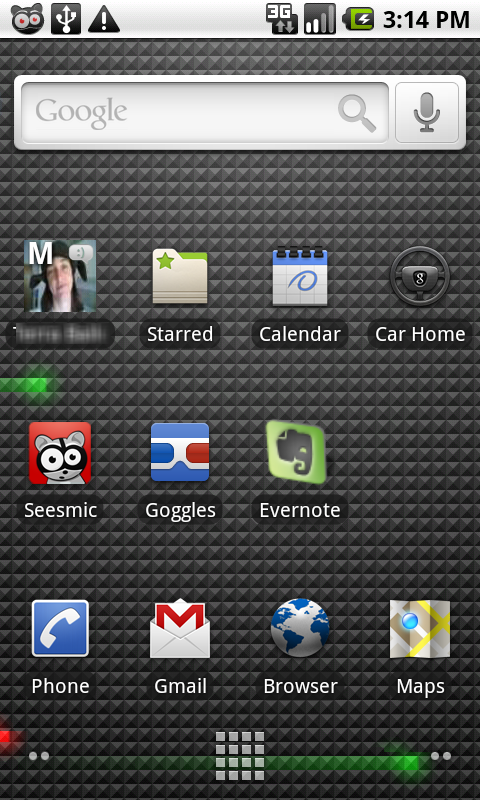 Long-pressing on the homescreen gives you the option to change your wallpaper, Widgets and jump into launcher settings. Quick Settings has also been overhauled in Lollipop. Instead of doing a two finger swipe to get to quick settings like we've done since Android 4.2. You can now swipe down part way to see your notifications and swipe down all the way to get to Quick Settings. Inside the quick settings you'll see all kinds of info like the date & time, your next alarm, battery status, shortcut to settings, a shortcut to changing users. As well as a brightness slider, WiFi, Bluetooth, Data, Airplane Mode, Auto-Rotate, Flashlight, Location and Cast Screen toggles. They all work as they should now. For example, tapping the wifi button will turn on or off wifi, instead of taking you to the wifi settings. Much better now in Lollipop. Jumping into security. Any device that launches with Lollipop will be encrypted by default. Which will be a big deal for businesses that do BYOD. And for everyone else that wants their data to be encrypted and safe. Another security feature here is Smart Lock. It's basically Google's take on Trusted Devices which Motorola started up last year. With Smart Lock you can set up a Bluetooth Device or NFC Tag to unlock your device. So for instance, I can use my LG G Watch R to unlock my Nexus 6, as long as they can communicate with each other. If I leave my phone behind and someone picks it up, they'll need to know my password to get into it. Which is pretty cool. It's definitely a welcome feature, and should get more people securing their device which is a big deal I think. Even the battery stats have been overhauled in Lollipop. Not just visually, but how they work as well. It used to be that the graph showed from the time it was unplugged from the charger til the current time. But now it shows the time from the charged was unplugged until it should be dead. It also shows about how much battery you've got left. For instance, right now, the Nexus 9 is showing I've got about 4 days of battery left right now. If you hit the action overflow in the corner you can go to the Battery Saver and save a bit more battery life. Which is especially good if you're out on the road or something and running out of battery. Google has also overhauled Recents. Before you got a pretty boring list of apps that appeared on one side of the screen. Now in the center you have basically a carousel of apps that you can scroll through. Google also treats Chrome tabs as separate apps in recents now. So you'll see all of your Chrome tabs in there as well. It's very quick and snappy as well, which is an improvement over KitKat and earlier versions. Lollipop is an amazing update for Android. Everyday I'm finding more and more features that I didn't know were in this update. The design is also very nice, I think it's much nicer and more modern for the OS. There's all kinds of new features and goodies in Android 5.0 Lollipop and I can't wait for everyone to experience this. Which should hopefully be very soon.